The Need: Low capacity weighing scales (10gm to 2Kg) fill the niche between laboratory balances, sometimes referred to as analytical scales, and commercial scales. These low capacity scales are used for weighing jewelry, precious metals, letters, food items, and small parts just to mention a few items. These scales however suffer from low accuracy, questionable reliability and repeatability, and are easily damaged when subjected to minimal overload. The two chief reasons for this are (1) in order to maintain low cost, performance is sacrificed and (2) the technology used does not lend itself to very much abuse. Yet, the growing awareness of the benefits of healthy eating and cooking, the rising price of precious metals and the increase in postage and delivery costs requires a more robust and accurate solution while still maintaining the low cost traditionally associated with these types of scales. Value Proposition: The new generation of low capacity weighing scales using BH Sensors patented, disruptive technology provides a compact low profile solution that has high overload and shock handling capability, measures to a high degree of accuracy, achieves higher reliability and enhanced functionality, at an equal or lower per unit cost than current commercially available low capacity scales. Requirement: New low capacity weighing scales are needed with greater reliability and durability, better repeatability and accuracy of measurement, and ruggedness to handle shock and overload for the consumer and commercial environment. Technology Description:Our patented sensing technology allows for the design of a unique bending beam structure that maximizes displacement while reducing stress in the overall structure. This allows us to manufacture a much thicker bending beam structure capable of handling >20X overload without any measurable change in the elastic bending properties of the beam. The non-contact sensing method allows for simple microcontroller based circuit design and implementation that integrates RS-232 or RS-485 networking capability without the need for complex signal conditioning to make the measurement. Manufacturing costs are kept very low due to the unique design and technology incorporated. 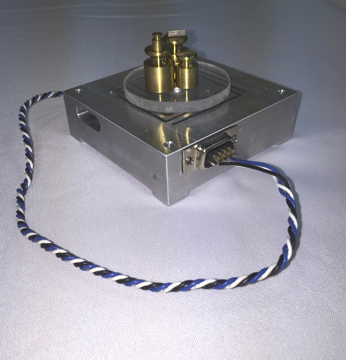 Scalability: This case study focuses on a low capacity weighing sensor and scale. However, nothing prevents the design and construction from being scaled so that heavier capacities such as 10’s, 100’s and even 1000’s of Kg could be measured with equal accuracy, robustness, and reliability.